The new generic online programme is targeted at qualified coaching looking to transition into training para-athletes. The IPC Academy, the education division of the International Paralympic Committee (IPC), has launched an introductory online programme for coaches looking to get involved in training athletes with an impairment. 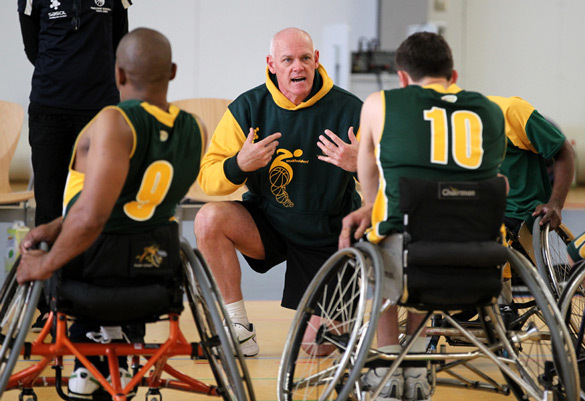 Titled "Coaching Para-Sport: An Introductory Programme", the generic course is targeted at qualified coaches of able-bodied athletes who are looking to adapt their coaching programmes and styles to suit the needs of athletes with an impairment. Across four modules, the programme will help delegates to understand and define various classification impairment groups, the methodological principles inherent in para-sport as well as exercise management. The programme concludes with a look at the psychological considerations for coaching athletes with an impairment. One coach who has successfully transitioned from coaching able-bodied to para-athletes, is Guido Bonsen, Head Coach of the Dutch Para-Athletics team. "There aren't too many differences between coaching Olympic and Paralympic sport," Bonsen explained. "Athletes are all people with the same minds, the same energy systems, the same dreams and the same good days and bad days. "I started this job in 2009 with no clue about para-athletics. I learned and developed together with my athletes. It made me a better, more creative coach. As a coach I see the impairment as inspiration to be creative in my programmes that I set. I love to make up exercises that you are only able to perform when you have a certain impairment. "For me personally, my motivation is to help my athletes in fulfilling their athletic dreams. They want to be successful at what they are doing and discover how fast they can compete or how far the can jump. "If you are a coach and you're getting involved in training an athlete with an impairment there is not a lot of information you can find," Bonsen continued. "This Coaching Para Sport programme will help coaches get started in coaching people with an impairment. I hope more and more sports clubs in the world will have people with impairments training together with their able-bodied peers, and this programme will help that happen by making coaches more aware of impairment types and needs." Chris Solly, Director of the IPC Academy said: "Coaching requires extensive knowledge and skills in many fields such as training principles, exercise physiology, biomechanics, sports psychology and others which is acquired through national and international coaching certificates in various sports." As part of the IPC Academy's expanding educational resources the Introduction to Para Sport programme is a pre-requisite which must be completed before beginning this Coaching Para-Sport: An Introductory Programme. This coaching programme is aimed as a generic para-sport coaching programme and sport specific workshops may become available across various IPC Sports with both IPC Athletics and IPC Powerlifting already offering such workshops.